Ok, here is what I think I wrote when it was all lost yesterday. Lloyd and I watched the Olympic opening ceremonies and for the most part – it was fantastic! I didn’t care for the ‘music through the decades’ part, but there were several moments that made me teary. Google ‘olympic cauldron lighting’ and get out your tissues. 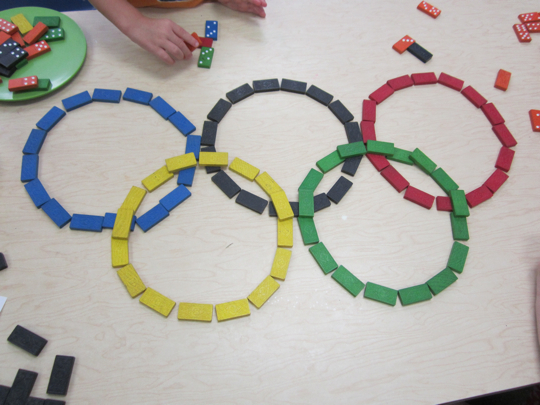 I have never paid much attention to the Olympics, but this year the preschoolers and I are getting pretty involved. The london2012.com website had live coverage of the torch relay that went all over the UK. Did you know that they started the relay back in May? Did you know that the torches have 8,000 holes in them to represent the 8,000 athletes (and to dissipate the heat)? Did you know they carry back-up Olympic flame in case the torch goes out? Neither did I.
Lloyd has a distant cousin at the Olympics. Jordan Larsen is on the volleyball team, and she is connected to the Nebraska Sommerers. Apparently she knew when she was 12 that she wanted to play in the Olympics. I admire that kind of dedication, though I can’t understand it. When I was 12, I quit track after two weeks because apparently it involved ‘running’. *jibblie* If I tried to run now I think my heart would burst out of my chest – not in a ‘so full of love’ way but an ‘ill-equipped to supply my body with oxygen’ way. I cannot believe you didn’t get a pommel horse for the kids to try. Will you be doing an exhibition of ribbon dancing as well? Awesome! What cool activities you come up with for your kids! If only TV watching were an Olympic event, I’d have a collection of gold medals too! Perhaps you could make medals out of the foil yogurt lids just like the Dunder Mifflin gang did on The Office.